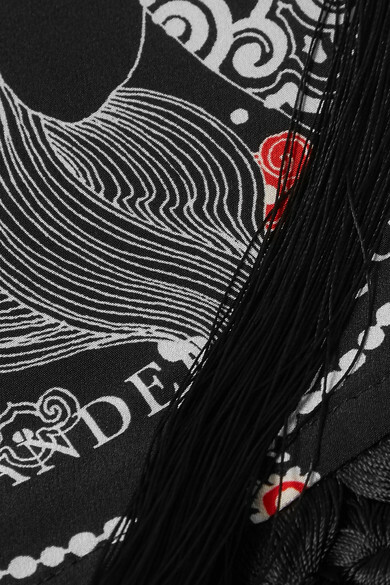 Alexander McQueen's scarf is emblazoned with the house's illustrative 'Eve' print that's inspired by the Art Nouveau style of the early 20th century. Part of the Fall '18 collection, it’s been cut in Italy from fluid silk trimmed with heavy tassels to ensure it holds its perfect drape. Wear it with tailoring or let it enliven your favorite LBD. Shown here with: Loewe Dress,Sophie Buhai Rings, Sophie Buhai Earrings.